Keep smiling, keep smiling and we'll see what tomorrow brings. Keep smiling, keep smiling and be thankful for the little things. 'Cause we won't be around forever, so come on all lets join in together. I spend my pocket money then I play ps with my chums. Depending on my mood whether I would change pathetic fallacy. It's amazing what a single friendly smile could do. 'Cause deep down we're connected like sisters and brothers. 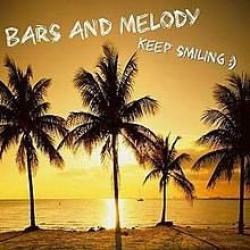 KEEP SMILING es una canción de Bars and Melody. Agradecemos a Valeria D. por haber subido la letra.